Being a superhero certainly isn't easy. Being a superhero with a partner makes things a little easier, but when those partners have a special bond things get a little more complicated. IDW's release Insufferable #1 is a book that pairs two superheroes together in a way that stops evil at the expense of their relationship. The issue is written by Mark Waid, illustrated by Peter Krause, colored by Nolan Woodard and lettered by Troy Peteri. What happens when your crime-fighting sidekick grows up to be an arrogant, ungrateful douchebag who makes Kanye look humble? Worse, what on Earth could force the two of you together for one last case? Nocturnus and his former protege, Galahad, will find out—if they don't kill one another first. At its core, Insufferable is a story about a father's relationship with his son. In the case of Nocturnus and Galahad, it's one fraught with another layer of complexity considering their superhero tendencies, but Waid does an exceptional job grounding it in the basic traits of parent-child interactions. Both Galahad and Nocturnus are more than capable of holding their own as superheroes, even if Nocturnus has lost a step or two. What's especially poignant though is Nocturnus' commitment to Galahad, even though he's let his abilities go straight to his head and ego. Waid allows Nocturnus to demonstrate true parental affection, even leaping to his son's aid in the eyes of the public and taking the blame for their falling out. It's very clear that Galahad was the one who made the decision to end their partnership, but Waid doesn't let Nocturnus escape without fault of his own. There's a very mature tone in Krause's illustrations that add a layer of emotional weight to the characters and their interactions. The characters feel real and Krause does a great job of contrasting past with present in his presentation of Nocturnus and Galahad. While Nocturnus' costume feels a little dated, Galahad's is more modern. Both costumes are great reflections of the characters donning them in terms of the timeliness of their approach to life and crime-fighting. Probably the most powerful panels though are a spread across a few pages that show Nocturnus and Galahad side-by-side in vastly different settings and lifestyles. Insufferable #1 is a fascinating look at the intricate interactions between characters who are crime-fighting partners and family. Anytime family is involved, emotions and dealings become much more varied, creating natural tension that feeds well into the story. Waid's story is both an introduction and a state of the family, providing two characters in Nocturnus and Galahad who are estranged from one another, yet the father clearly still cares about the son. Krause's illustrations are mature and ensure the book has a dark tone throughout, accented by Woodard's use of bright and dark colors. 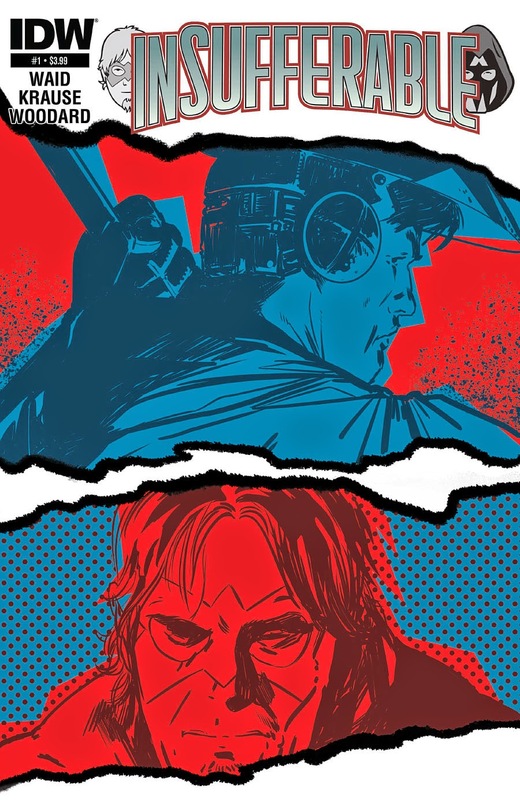 Insufferable #1 is a great first issue that at the very least as an intriguing dynamic between the two characters that will likely lead to some tense situations in future issues. 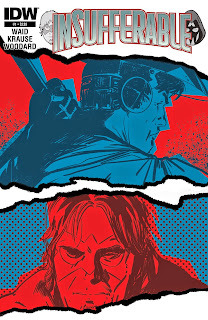 Insufferable #1 is in stores now.